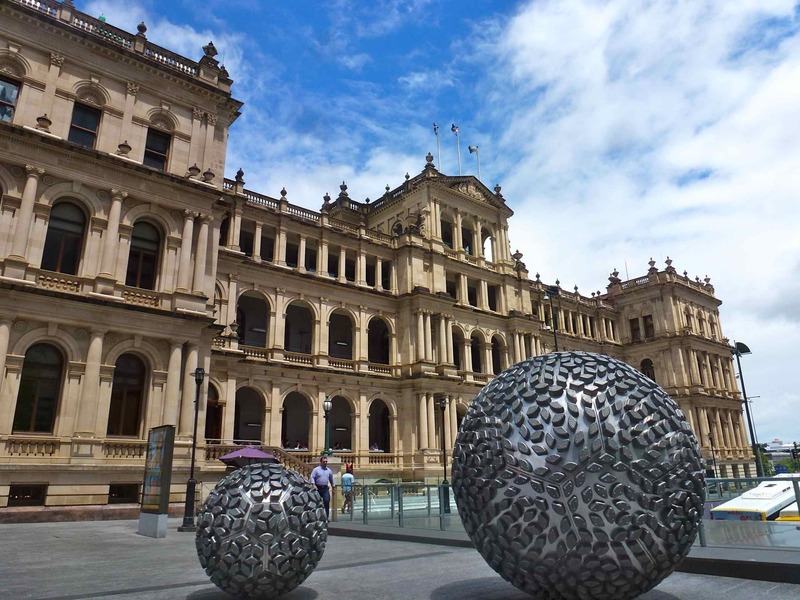 I like surprises and Brisbane city is certainly a box of treats. We arrive at the Youth Hostel in the late evening. The constant deluge of rain has followed us up from Surfers Paradise and I wonder what this city can offer us in the next few days? Lucky for us the rain is gone in the morning, replaced with a bright blue sky above. The busy Youth Hostel has a small choice of hire bikes displayed out front and we seem to be the only ones interested in snapping up a pair of the old off-beat cycles. 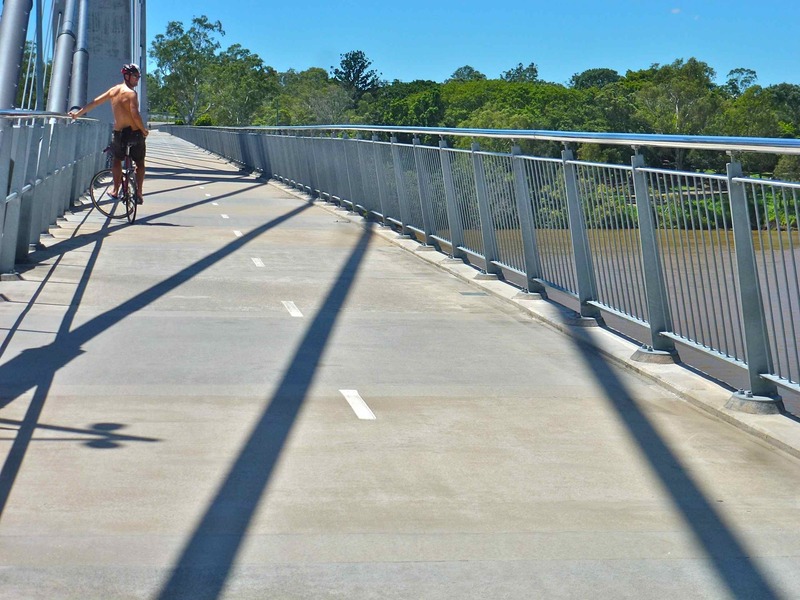 Finding the cycle ways in Brisbane is not too difficult – you simply pedal down to the Brisbane river. The cycle way we find hugs the river. It weaves under massive concrete bridges and beside roads laden with polluted traffic. Down below the air is crisp and the greenery abundant. We feel hidden and safe from all the noise and confusion above. The boyfriend soon becomes curious about life above and a detour into the city centre becomes an uphill climb. My heavy bike only has two gears so my arms and legs certainly get a lengthy work out! We pedal up and down busy streets getting happily lost. 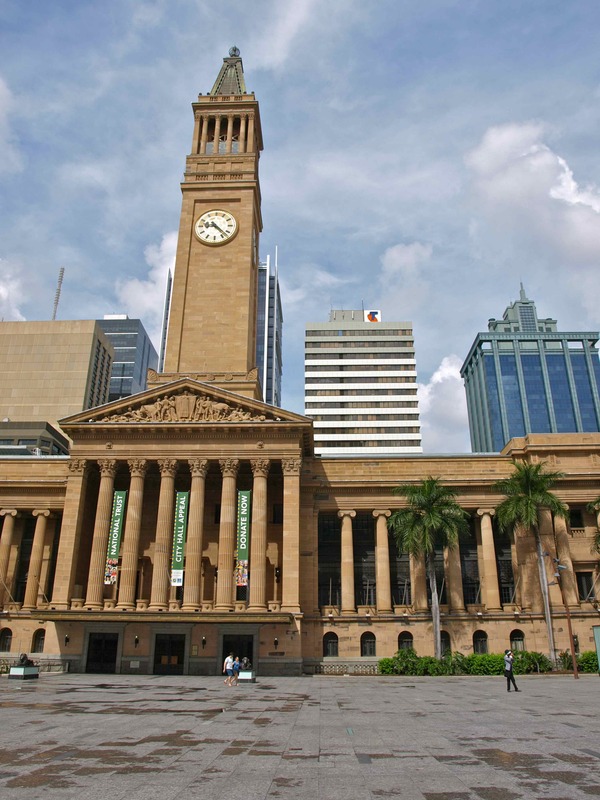 Brisbane City Hall, the Clock Tower and King George Square are all visual treats. After zig- zagging around we eventually find direction and pedal back down to the calm of the river’s edge. Few people are about and we seem to have the cycle way to ourselves. We stop at a quirky riverside eatery and enjoy a delicious cooked breakfast in the glowing morning sunshine. Time easily ticks by. 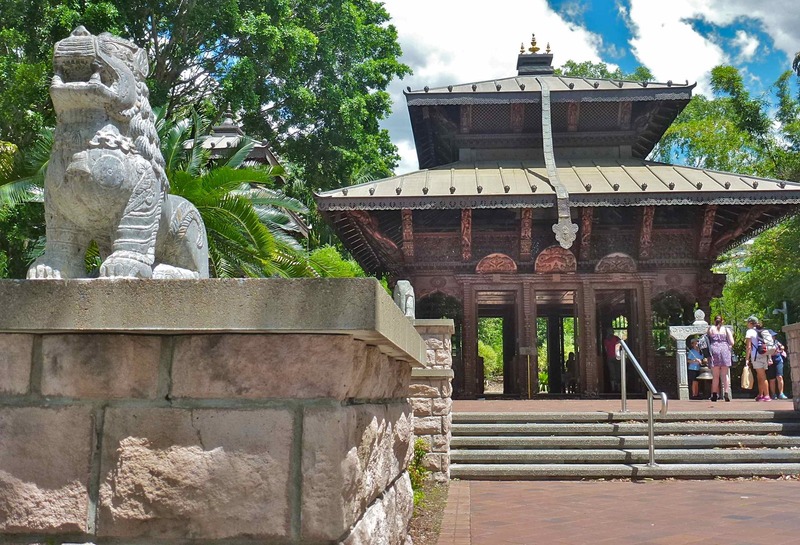 We jump back on our clunky bikes and enter the Brisbane city botanical gardens. It surrounds us with its sweaty scent of tropical jungle. A towering canopy of green protects us from the approaching grey clouds that turn the city a shade of grey. We push on, pedalling towards the suburb of New Farm. Ahead, Storey bridge has me mesmerised. 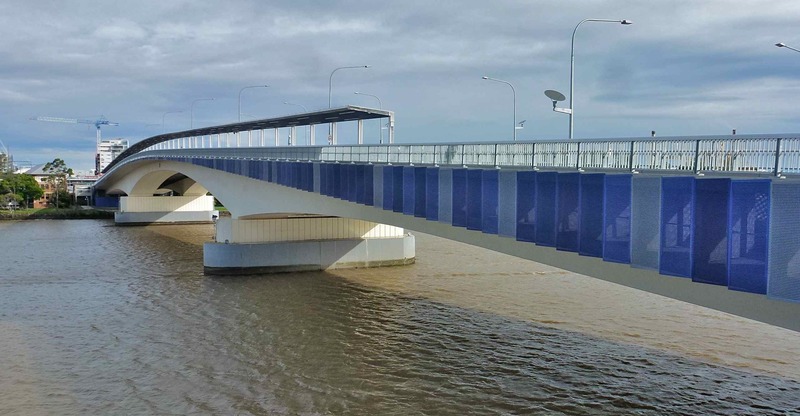 Its sturdy steel structure poses powerfully like an important business man over-seeing the static flow of the Brisbane river. Continuing to follow the bend of the river I find myself glancing back. The bridge sits as an industrial artwork fragmented against the backdrop of the glistening city. A steep climb leads us up and away from the river and the cycle path. We begin to follow bike signs along the road. New Farm is refreshing. It is dotted with colourful homes – where historic riverside factory buildings have become unique apartments and where corner coffee shops are buzzing with locals. We discover a few more cycle paths – allowing us to explore some riverside parks before we turn back to towards the city’s skyline. Kangaroo point greets our us with its imposing cliffs. The grey clouds have quickly passed as the heat in the air slows our pace. 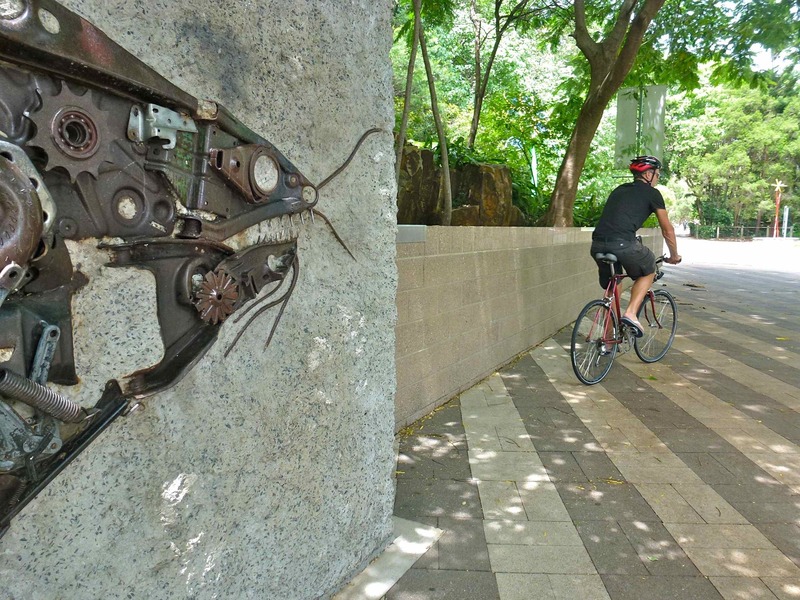 Creativity is everywhere as eye-catching artwork frequently decorates the riverside. We cycle in the direction of Southbank. South Bank is a busy hive. This is where all the people are! With its spacious museums, picturesque gardens, relaxing eateries and its own man-made beach who wouldn’t want to come for a visit? 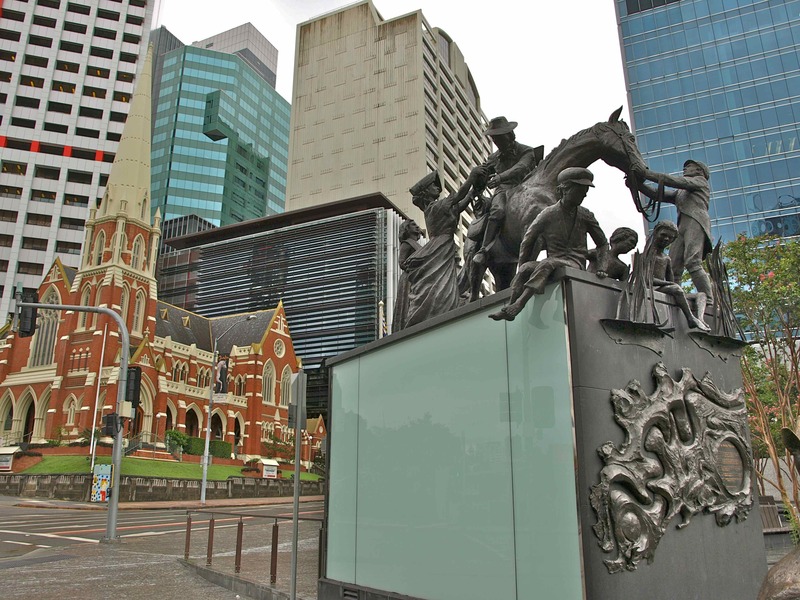 There is so much to see and do in this tiny area you could be here for the day, but we continue cycling over another fabulous bridge and then along the bicentennial bikeway which practically sits on the river. It guides us with a few diversions ( due to previous flooding ) beside the river. 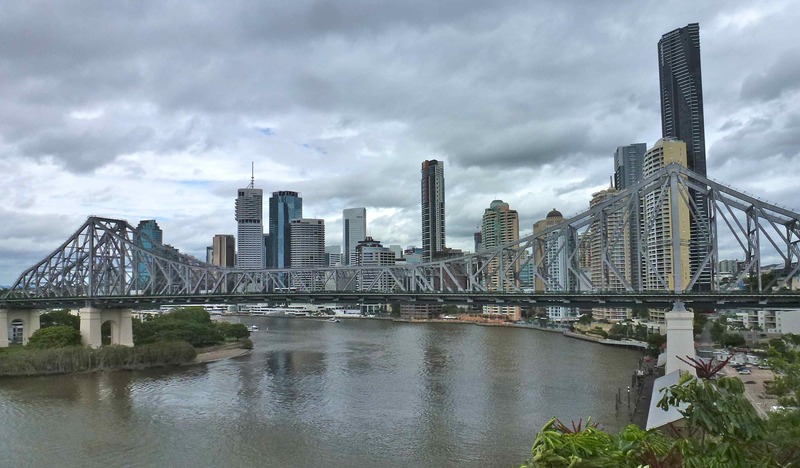 It by-passes busy suburbs and leads us towards the University of Queensland. The shade of the trees around the university grounds are a welcome relief from the heat and humidity in the air. Another cycle friendly bridge takes us over the river and guides us up Highgate hill where we rest under the trees – From the Highgate hill we are thrilled to find ourselves freewheeling alongside cars down into the inner suburb of the West End – where there are engaging boutique shops, fresh produce and friendly locals to chat to. Finally we pedal back to exciting South Bank where we watch the radiating sunset in an open air bar with a glass of bubbles! 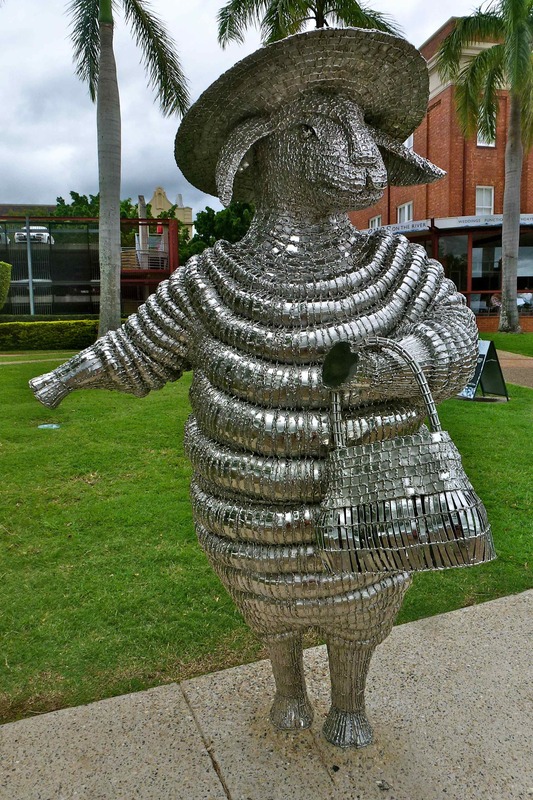 Wrap her up and give her to me any day – Brisbane is a real treat! This entry was posted in Australia, cycling and tagged adventure, Australia, bicycle, blog, brisbane, cycling, journeys, life, photography, travel, writing. Bookmark the permalink. I took my bike north of Brisbane by train and got off at Caboolture and started cycling from there and did a trip north then turned inland and made a bike loop south down into NSW. 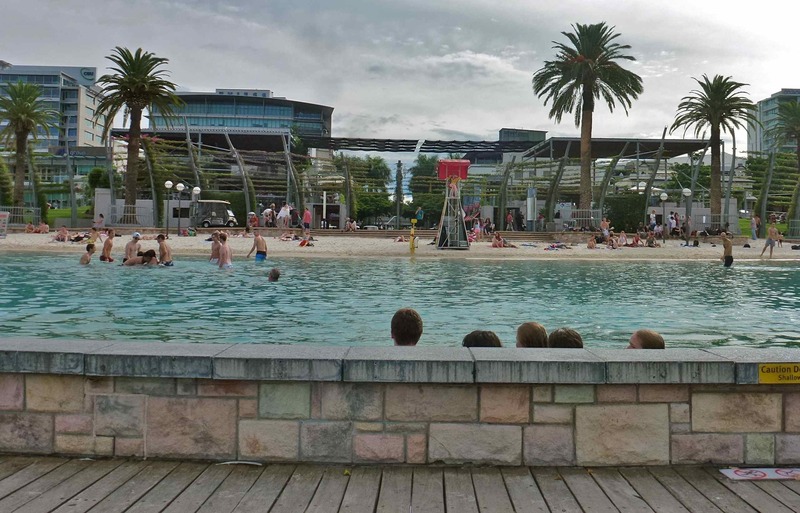 Brisbane and Coolangatta are both great place to start cycle trips. What a beautiful place to cycle. Thanks for posting such great photos. A great visual showcase of my hometown. 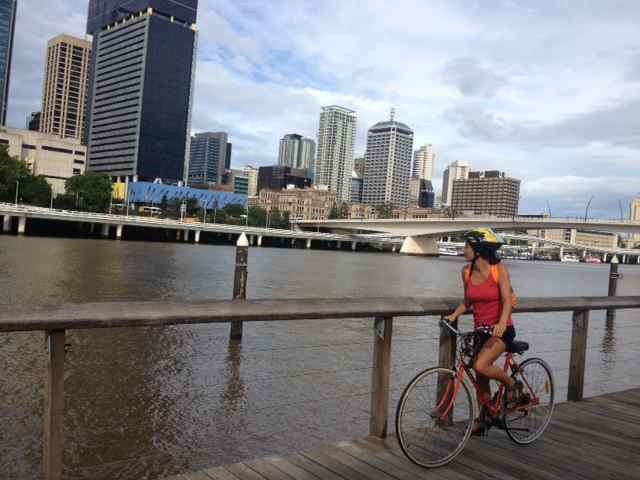 Glad you enjoyed your time exploring Brisbane by bike. I hope we can visit again some day? Thanks for taking the time to read my blog. We had a fabulous time – loved every second of it. We are hoping to visit again sometime! 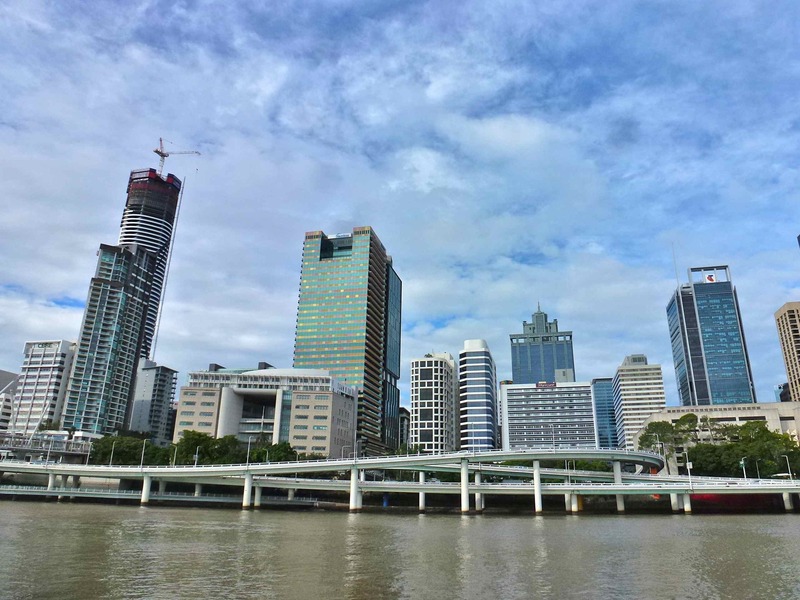 I’ve been lucky to visit most of Australia’s major cities…but somehow, Brisbane has eluded me! Would love to go for a ride down by the river! The river ride is well worth checking out – it is a great way to explore the city. I hope you get there some time?